We have all been touched by the resilience and resistance to the horror of the Trump administration’s fear-mongering – rejecting an anti-immigrant agenda, standing firm against hateful violence, and fighting back against the criminalization of people of color and immigrants. We all know that we cannot bear the costs of allowing misogyny, racism, xenophobia and all other poisons to take deeper root. These times demand that we fight together for a world that embraces diversity, human rights, and justice for all. It has been a tough year on many fronts. At IDP, we have engaged our unique expertise to respond to the unprecedented demand for our services to protect those most at risk. Our dedicated staff has remained committed to responding to crisis after crisis, while also developing strategic solutions to an ever-changing enforcement landscape. As families and communities continue to be separated and devastated, IDP has responded by parlaying its twenty years of experience into the development and employment of innovative policy initiatives, intersectional alliance-building, community defense, impact litigation, and strategic communications. For more on IDP’s 2018 successes, check out our end of year highlights! IDP’s advocacy efforts grew significantly this year. We moved forward local and national advocacy campaigns, including the recently launched Immigrant Clemency Project, the #ICEOutofCourts campaign, the One Day to Protect New Yorkers campaign, and an advocacy day in Washington, DC with our Immigrant Justice Network partners. IDP has worked with allies on two influential Supreme Court cases, one fighting the harmful and ubiquitous practice of prolonged immigration detention (Jennings v. Rodriguez); and another that resulted in preventing the government from using an unconstitutionally vague legal statute to execute mandatory deportation orders (Sessions v. Dimaya). In the Second Circuit, IDP’s litigation work with allies brought victories that included one case challenging deportations based on certain misdemeanor offenses (Obeya v. Sessions) that sit at the center of the racialized war on crime and war on immigrants; and a second case that rejected the government’s attempt to deny derivative citizenship to a young man who had been incarcerated as a teenager and separated from his naturalizing parent (Khalid v. Sessions). This has been an impactful year for IDP’s work in community defense. In July, we launched ICEwatch: ICE Raids Tactics Map, an interactive map that details ICE’s deceptive and aggressive tactics and includes summaries of nearly 700 raids, and a Raids Tactics Report, offering a detailed look at the raids trends IDP observed in 2018. 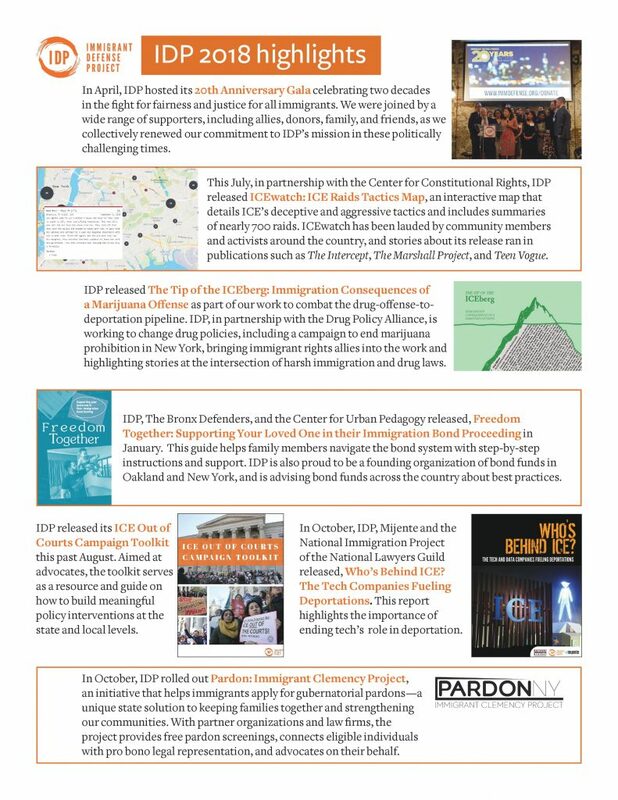 IDP also released several toolkits this year, in conjunction with coordinated advocacy campaigns, including our Pardon and ICE Out of Courts toolkits. One of IDP’s greatest challenges in the current climate is shifting the narrative that demonizes immigrants with criminal convictions. Our increased and effective communications work has resulted in a consistent stream of background, on-record interviews, and story placements. In addition, IDP co-founded and coordinated Commrades, a collective of communications staff from leading national immigrant rights organizations focused on criminalization and enforcement. Only thanks to your ongoing partnership and support can we share these victories from this past year, and lay the foundation to continue the fight in 2019. The threats we face are numerous, but together, we can make an impact. Your contributions are critical to IDP’s work to ensure justice for individuals, their families and their communities — our communities. On behalf of: Alejandra Lopez, Andrew Wachtenheim, Ariadna Rodenstein, Benita Jain, Genia Blaser, Jane Shim, Joe Celestin, Lee Wang, Manny Vargas, Marie Mark, Nabilah Siddiquee, Natalia Renta, Patrick Baker, and Ryan Muennich. P.S. In the next few months we will update you further on the specifics of our plans for the next year. For updates on our work until then, follow us on Twitter and Facebook. For now, please consider becoming one of IDP’s monthly sustainers, if you haven’t already, and reaching out to us for any more information. Please note that donations to IDP are processed through our fiscal sponsor, the Fund for the City of New York (FCNY, a charitable organization. All donations are eligible for charitable donations under section 170 of the Internal Revenue Code. No goods and/or services were provided by the FCNY in exchange for this donation.